Paul Calabresi Clinical Oncology Research Award is a research program to help oncology research investigators independently design, implement and manage all phases of hypothesis-based cancer clinical therapeutic research. The program will also support oncology researchers to work effectively in collaborative research team to develop cancer clinical trials, obtain independent research funding, publish research result in peer-reviewed journals, and mentor junior colleagues. The American Cancer Society is one of most prestigious research funding programs that provides support of cancer research and health care professional training. This program especially focuses on supporting junior cancer researchers who have not yet received major grant funding. The American Cancer Society Institutional Research Grant will provide these junior researchers seed grants to start up their research projects. Katja Kiseljak-Vassiliades, DO, Instructor, University of Colorado School of Medicine, Department of Medicine, Division of Endocrinology, Diabetes and Metabolism. Robert C. Doebele, MD, PhD, Assistant Professor, University of Colorado School of Medicine, Division of Medical Oncology. Margaret E. Macy, MD, Assistant Professor, University of Colorado School of Medicine, Department of Pediatrics. Carrye R. Cost, MD, Assistant Professor, University of Colorado School of Medicine, Department of Pediatrics. Sana Karam, MD, PhD, Assistant Professor, University of Colorado School of Medicine, Department of Radiation Oncology. Elaine Lam, MD, Assistant Professor, University of Colorado School of Medicine, Division of Medical Oncology. Last year University of Colorado Anschutz Medical Campus received $395.2 million funding in research. These $1 million research grants, together with additional $41 million federal research grants that the University of Colorado has received in 2014, show a promising future for Colorado life science researchers. The University of Colorado Anschutz Medical Campus is a well-funded market and home to groundbreaking research projects. If you are a laboratory supply company, your new products and services can help academic research projects develop efficiently and be even more productive in the future. This article brought to you by Biotechnology Calendar, Inc. producing the annual BioResearch Product Faire™ Event on June 19th 2014. 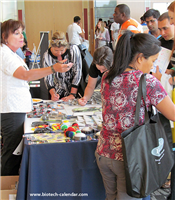 Last year About 500 research professionals attended the Annual BioResearch Product Faire™ Event at CU Anschutz Medical Campus. These attendees came from 14 different research building and 60 on-campus departments. Of these attendees, 30% were professors and purchasing agents and the rest were actively working in life science research projects. Or you can read the 2014 Show Schedules to participate in events at different institutions.